Article Overview: The Americans who tortured and humiliated the prisoners in Iraq chose to erase the Moral Box that civilization assigns us all. In war, the Beast of Terror takes over, and turns many into primal beasts, willing to write their own moral codes, while others, such as the 170,000 American troops not part of the torture, suffer the fungus effect of a few's actions. Learn about War's Moral Box and how all of us, when tested, are tempted to become Beasts, willing to maim, torture and avenge the loss of a loved one. GROUND ZER0, New York, N.Y.--May 7, 2004 -- I am feeling a hole in my warrior's soul as I watch Donald H. Rumsfeld, U.S. Secretary of Defense, the top of the military/political food chain, caught in the crosshairs of the U.S. Senate Armed Services Committee. White-haired Senator John Warner, a Republican, is reading a statement lambasting the torture and humiliation of Iraqi prisoners, laying groundwork for the top leaders to be put on trial along with the young American female MP joyously dragging a naked Iraqi prisoner around with a rope tied to his neck. Part of me screams about the horror of it all--the horror of the world seeing these small but giant crimes against humanity as the facade of America's willingness to fight and die in Iraq. Studying the pictures of torture and humiliation, plus the joy expressed by those doing it, degrades and demeans the 170,000 other warriors in Iraq and more than 700 who have died in an attempt to build not destroy the image of America as a liberator rather than just another tyrannical oppressor, steering the land toward freedom, liberty and the highest of all societal moral standards toward others. 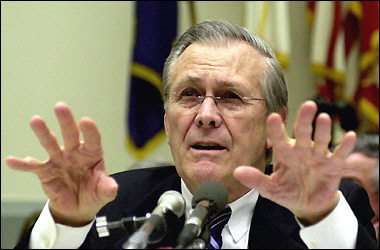 Rumsfeld apology rang hollow to may critics of his closely guarded administration of the war. He knew about the problem from the Red Cross in January and February, long before the pictures were released and didn't inform the President or Senator Warner. Of more concern, no obvious actions were taken to remedy the problem, or defuse the slow-burning political bomb that has now exploded at the doorstep of the world's media, especially within the Congress. Now, the lack of action against the charges has led to the court of world public opinion and the instant conviction of America as a Beast of Terror, if not worse than, then equal to, the Beast that America drove from the palaces when Saddam Hussein's regime fell. America is not the only nation under the gun for mistreatment of prisoners. London's Daily Mirror has been publishing front-page photos of British troops engaging in similar acts of inhumane treatment and demeaning torture to Iraqi prisoners. It would seem the civilized approach to war has been retarded, but that is a quick view. However, the bigger picture of what is going on and why needs introspection. There is progress toward the management of war's atrocities, even if it is small. Despite the shame and ugliness of the scenes being broadcast through the global communities, many of whom are eager to drive America out of the world's business, America have performed a major task in its role as chief peacekeeper, its legacy as the Sentinel of International Vigilance. 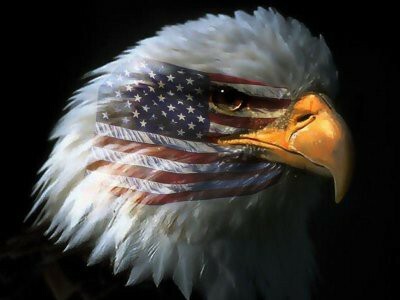 It proved once again America's willingness to stand up to the Terrorism, to chase the Beast to the ends of the earth until it is rendered lame. The torture photos should not diminish this role. Fortunately, Rumsfeld is on trial today. In my day, a generation ago, Lt. William Calley was on trial. He stood alone before the court of world opinion for his role in the My Lai massacre where he, in a fit of rage against the enemy, killed 22 women and children in a mass execution of suspected V.C. that was termed "premeditated murder"
None of the top officers in the military or top politicians stood in front of Calley. He alone took the bullet. Then Secretary of Defense, Robert S. McNamara, ducked the bullet that Rumsfeld is taking until he finally spilled out his feeble share of the blame in his 1995 book "Mea Culpa" and most recent film, "Fog of War" where he accepts blame for the debacle of Vietnam. He, like the soldiers guarding the prisoners in Iraq, made his own Moral Box. War creates personal Moral Boxes. 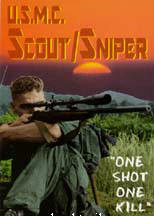 Each warrior draws his or her lines as to what is "moral" and "immoral." Some will draw the lines wider and wider, believing they have the authority because of the gun they carry and the charge to "kill the enemy" that this authority includes being "god," being "judge and jury" over the enemy, and treating the enemy as inhuman as can be imagined, and then some. I witnessed horrible tortures and deaths of Vietnamese prisoners in Vietnam, scenes that sickened me in one way because the void of compassion in executing the torture, in the degradation of human life as it slowly beaten to death in the process of getting information that might save American lives. On the opposite side of the coin was the blood of my comrades. Prisoners who withheld information that could save your buddy were not human. They were time bombs who held the secrets of life and death over your friends, your allies, and whatever you did to them was justified, at least in the sense of "saving the lives of others" because they were "evil," ready, willing and able to slit your throat, to let you walk into an ambush, to allow you to stumble upon a punji pit with sharpened bamboo spikes laced with human feces so any wounds you received would quickly infect and maximize the chances of you dying before you could receive medical attention. The Moral Box of War--the one that everyone who looks through the sights of their rifle with and chooses to kill or not kill those who are in its crosshairs--can shift dramatically when the guy you are closest too gets his head blown off by a mine, or a sniper puts a round into the eye of the guy next to you and his brains splatter on your face as you hug the earth, hoping you won't be next. That horrible Beast within roars. All the civilization that one has learned, all the moral regulations, evaporate. The primordial ooze of the Caveman, the growling, grunting Beast whose eyes dart and fingers twitch about his club as he searches, like a savage, for anything that moves so that he can bash its skull in, eat its brains, thump his chest and roar that he is victorious, ruler of the land, and then marks the earth with his urine to warn off all who might venture to trespass until they come across the mangled remains of his handiwork, his barbed wire fence of Terror that warns the world to BEWARE THE BEAST. This transition back to primal behavior is not just limited to the arena of war. The mother or father whose daughter is raped and ravaged by some sexual predator engage the same rage as the Caveman, willing and eager to beat him and smash him and torture and humiliate him before they rip his arms and legs off, and place, as the American Indian women and children once did to captured cavalry soldiers, small piles of tinder over the sprawled, tethered body of their victim and light them each day so they burn holes through the flesh until finally, just before losing consciousness, they set a pile of tinder directly over the heart and dance as the body convulses into its final state of mulch. The savagery of human beings has always broken through the Moral Box society and civilization tries to constrain the Beast Within with by imposing laws and regulations for "humane" behavior. But when war occurs, the "license to kill" diminishes those lines, and young people, such as those in Iraq guarding prisoners, expand their Moral Box to include the savagery of the Beast we are now seeing represented by pictures shaming America, shaming our intent to liberate, shaming all those who keep the constraints of their Moral Boxes intact despite the nagging Voice of the Beast of Terror who whispers: "Kill 'em all....they will kill you...kill 'em all...they are inhuman. You have the right!" The parents of the raped and butchered child hears the same words hissing in their ears, for our civilized natures are fragile, like rice paper, and those of us who think we are exempt because of what we consider to be "high moral footing" must be wary about the time when the Beast comes to our doorstep, and lays down the mangled body of someone close to us, and laughs in our face. I do not condone the behavior of the guards who treated the prisoners the way they did, but I also understand their behavior. I understand that war is ugly for it creates in us all the ability to shift, erase, expand or bend the Moral Box of human behavior to fit our needs at that particular moment. Unfortunately, we do not have statistics and neither do we leap up in joy and jubilation over the kindness and compassion shown to Iraqi people and prisoners with the same effort we hang our heads in shame when we see the horrors of war unfold before our eyes. It is like the news. The more ugly and bloody the news, the more readership. The more "bland" the less. Good News papers don't make it. Bad News papers do. Similar to rumors, people tend to pass on the "dirt" about another at lightening speed and tend to let the "glory of good deeds" fall to the wayside, as the aren't "juicy" to the pallet. When I was a U.S. Marine Combat Correspondent in Vietnam, my job was to cite and record the stories of war, and most of those stories were about the compassion and respect our troops paid to others who might easily be called our "enemies." There was ugliness of course mixed into the equation, but the average American Marine, Soldier, Sailor, Airman, Coast Guarder, was and is the average guy or gal from the average town in America. They are "good kids" who believe in fighting for the rights of others, and dying for those rights if necessary. Most of them have fought and struggled with their Moral Box, to keep it as firm as possible under incredible pressure to release their grip on civilized behavior. We forget about all those who chose not to act as a tyrant, as a Terrorist, all those who could have easily become Beasts of War but rather struggled to maintain the much harder position of Sentinel of Vigilance, carefully picking their targets, not eager to kill anyone unless absolutely necessary, treating their prisoners with respect and dignity despite the fact they might have just killed a buddy or pal. These people are our unsung heroes of Iraq, whose great Courage, Conviction and Right Actions will not be recorded or shot onto front pages of papers, or featured on 60 Minutes Two. At this moment, when the world is looking at a few Americans whose Beast of Terror cause them to erase their Moral Boxes, the tens of thousands of Americans who have fortified their Moral Boxes will be victims of the fallout of the few, will be tainted and some deeply scarred by the hatred spewing at them by default as the world convicts the whole for the acts of the very few. But I will not. 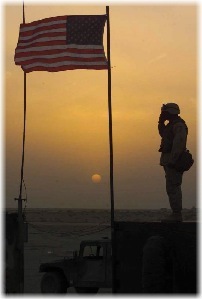 I will salute the true Sentinels of Vigilance in Iraq, those who have maintained their Moral Boxes, and hope you will too. 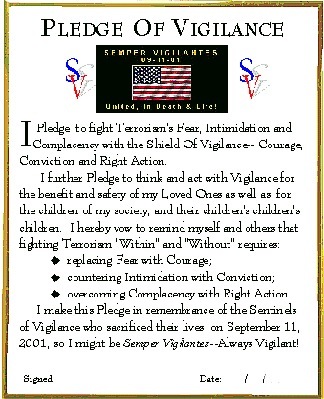 And, I will remind all that if you subscribe to the Pledge of Vigilance, it is a tool to help you keep your Moral Box strengthened, keep it reinforced, for it provides you a way to measure whether your actions are civilized or uncivilized. Had the Americans, for example, who were about to demean and torture the prisoners in Iraq asked this question: "Is what we are about to do to the benefit of the Children's Children's Children? Not just our own, but all children throughout the world three generations from now...?" The odds are they would have driven the Beast of War, the Beast of Primordial Ooze running. They would have realized the fungus they created will stick to America's legacy in Iraq for generations to come. But that fungus did not attach itself to those 170,000 other Americans who have maintained their Moral Box, who have resisted the hissing Voice of the Beast and stood above the desire to club the enemy to death when they have their hands in the air. We salute the Sentinels of the Moral Box. May 2--Torture, Terrorism & Iraq: Another Quagmire?